While the origin of this tradition is unknown, some speculate that it began in Fukuoka 300 years ago. Farmers, who were drinking sake beside a river, supposedly began grabbing handfuls of fish fresh straight from the water. They washed the minuscule animals down with their rice wine, not bothering to kill them beforehand. The practical angle for this ritual argues that because ice gobies decay rapidly once killed, eating them alive is as safe as it gets. Today, as with most hyper-fresh seafood, living ice gobies are considered a delicacy. Depending upon the prefecture, Japanese diners practice odorigui using different species of fish. 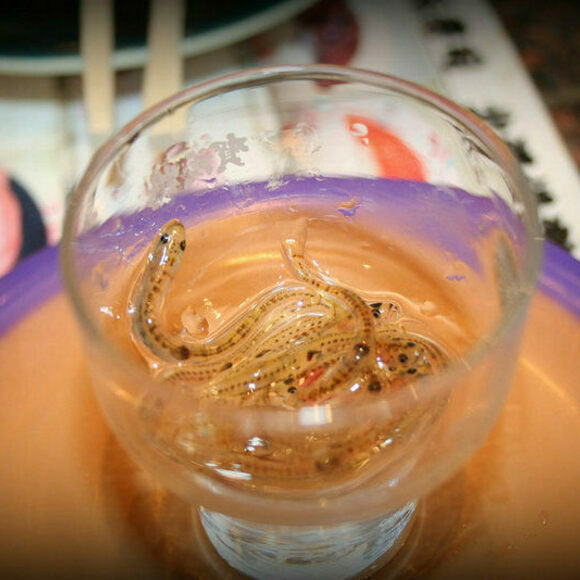 In the Yamaguchi prefecture, expect to find whitebait in place of ice gobies. Restaurants also (more often) serve cooked ice goby; it's less expensive, but considered less exciting. In Arkansas, this order will land you a plate of fried fish. When half of Barbados’s national dish migrated across maritime borders, drama ensued.